NextDecade, LLC, a development and management company of liquefied natural gas (LNG) projects, announced today that it has filed an application with the U.S. Federal Energy Regulatory Commission (FERC) for authorization to site, construct and operate Rio Grande LNG, a proposed 27 Mtpa LNG export facility near Brownsville, Texas and the Rio Bravo Pipeline, a 137-mile pipeline system that will provide the facility with its feed gas. 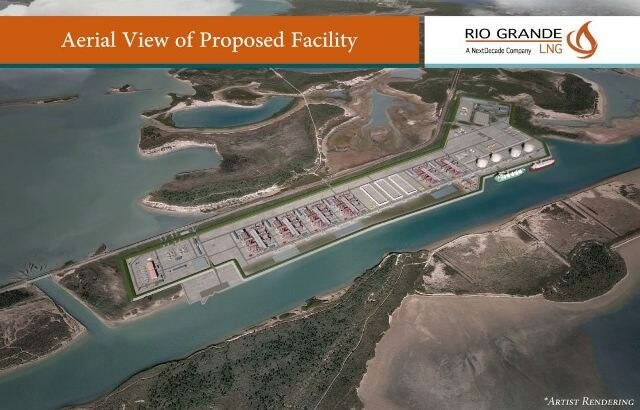 This action represents the most significant milestone to date in the development of Rio Grande LNG, positioning the project in an excellent position to sign offtake agreements and declare Final Investment Decision (FID) in 2017. In November 2015, NextDecade announced that it had signed non-binding agreements for 14 Mtpa of LNG with customers from across Asia and Europe. Since then, that number has grown to 26 Mtpa, demonstrating a continued desire for U.S.-produced LNG from customers around the world, and specifically, a desire for LNG from the proposed NextDecade facility. NextDecade expects to receive authorization from the FERC by the end of the first quarter of 2017 and expects to begin exporting LNG from Rio Grande LNG by the end of 2020. Pending FERC approval and FID, the project is expected to create between 4,000 and 6,000 construction jobs, and more than 200 well-paid permanent jobs, reflecting a potential investment of up to $20 billion. At full build-out, the Rio Grande LNG facility will be one of the largest LNG export facilities in the world, providing customers access to clean-burning natural gas, helping countries to drastically improve their air quality, reduce emissions and procure safe and reliable exports of U.S. natural gas.